'nip it in the bud' is a maxim that does not go with killing malaria-causing mosquitoes. The trick is to target older mosquitoes that have laid their eggs. Andrew Read and his colleagues from the Pennsylvania State University, US, explain. Fast-acting insecticides kill mosquitoes indiscriminately and stop them from reproducing. This encourages them to evolve insecticide-resistance. The numbers of pyrethoid-resistant Anopheles mosquitoes went up 20 per cent after three years of indoor spraying in Mexico. The researchers argued if the pressure to evolve was to be removed, it would be easier to control malaria. This could be achieved using slow-killing or late life acting insecticides. The team constructed a model of malaria transmission.The life span of a parasite within the mosquito's body varies from two to six gonotrophic cycles (10-14 days). A female mosquito takes two to four days between two blood-feeding meals in which time period she lays eggs. This is the gonotrophic cycle. At the same time, the life span of a mosquito does not go beyond a few gonotrophic cycles. These facts put together led the team to conclude most mosquitoes die before the parasite inside them is ready to infect again. Killing the older mosquitoes would then bring an added advantage. Since they would have laid their eggs, targeting them would not impact breeding, thus putting less pressure on them to evolve, said the study published in the April issue of Public Library of Science. The simplest way to create a slow-killing insecticide is to dilute a fast-acting one. Fungal biopesticides are also useful. 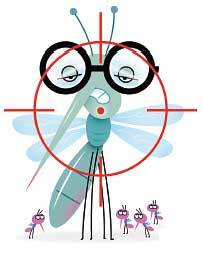 The fungi take 10-12 days to act after it is sprayed, thus killing the mosquito when it is old. Once put in use, this strategy could save millions of dollars that are pumped in to tackle malaria every year.